Friday 23 March is World Meteorological Day 2018 and this year the World Meteorological Organisation has named the theme – ‘Weather-Ready, Climate-Smart’. The recent cold temperatures and snow events have demonstrated the importance and value of being “weather ready” in the UK and as the UK’s National Meteorological Service, the Met Office’s forecasts and National Severe Weather Warning Service helped to ensure we were all well-prepared. The Met Office also ensures that the nation is ‘Climate-Smart’, delivering world-class climate research and science through the Met Office Hadley Centre for Climate Science and Services. 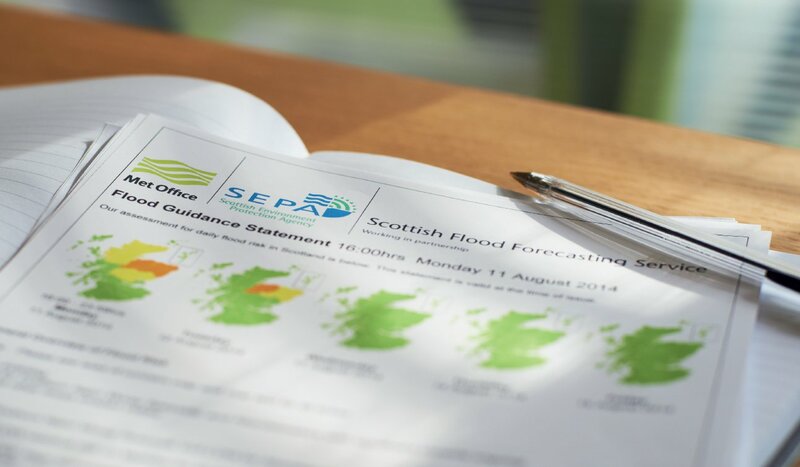 We thought today would be a good day to showcase the partnership between the Met Office and SEPA to deliver the Scottish Flood Forecasting Service (SFFS). The SFFS has been going since 2011. From the start it has been a working partnership between Scottish Environment Protection Agency (SEPA) and the Met Office. Operationally we work together to produce the daily Flood Guidance Statement, and provide forecast information to aid with the issuing of Flood Alerts and Warnings by SEPA. Additionally, the partnership is active in flood forecasting research, and facilitates the exchange of data between the organisations, as well as training, development and public awareness of flood risk. The work of the service, as highlighted in all the earlier articles on this site, would be impossible without the high quality meteorological data and expert advice produced continuously every day by the Met Office.